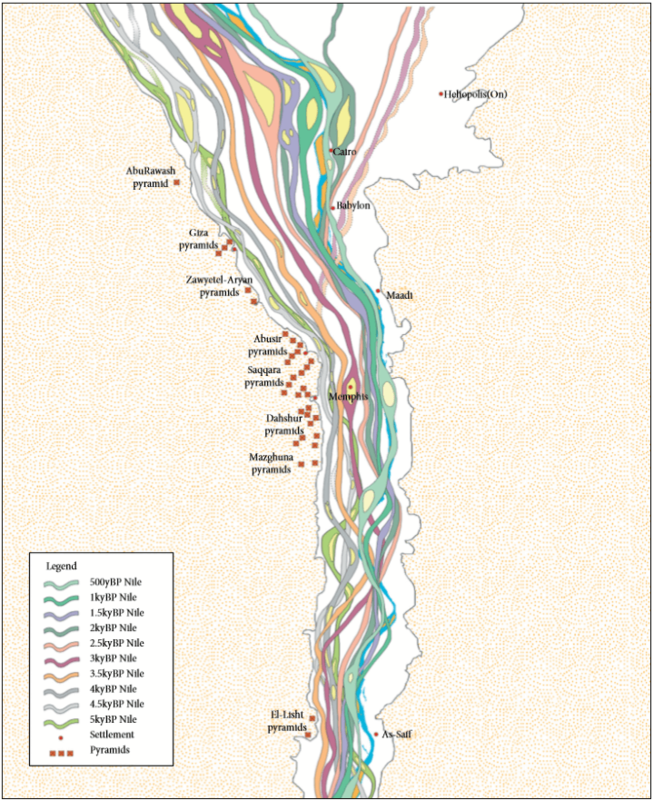 The map above shows how the course of the Nile river in Egypt has changed over the past 5,000 years. Additionally, it also shows settlements and Pyramid sites. And, the light blue line is its present course. Considered the longest river in the world at 6,853 km (4,258 mi) long. 11 countries share the water resources Tanzania, Uganda, Rwanda, Burundi, Democratic Republic of the Congo, Kenya, Ethiopia, Eritrea, South Sudan, Sudan and most famously Egypt. It has two tributaries the White Nile and the Blue Nile. Most of the Pyramids were built to the west of the Nile because it was considered the place of death, as the god Ra, the Sun, underwent birth in the east, death in the west. I love history and the maps engage my mind, thank you! Thanks on the map. you said BP (before present day), but forgot to tell us what KYBP in the list stands for. It stands for “n thousand years before present day”. K is for kilo.